Apple has just won a Federal Court case which prevents Samsung from selling the Galaxy Tab 10.1 Android tablet in Australia in the immediate future. However, if you're an Aussie who desperately wants to get your hands on the Galaxy Tab 10.1 right now, there are a few ways to do so. Purchasing a Samsung Galaxy Tab 10.1 in Australia is made possible by what is called grey importing, also called parallel importing. A grey import tech product is one that is imported from another country without the permission of the intellectual property owner, in this case Samsung. This can be achieved by an Australian business that buys the product overseas and then sells it online, or simply an International business that will ship the product to Australia. Is a grey import Galaxy Tab 10.1 different to the Australian model? As the Australian model of the Galaxy Tab 10.1 has not been sighted due to the ongoing Federal Court case, it's impossible to compare it to grey imports. That being said, an imported Samsung Galaxy Tab 10.1 will work perfectly well. It's simply a model that's sold in an overseas country. The UK model of the Galaxy Tab 10.1 is a popular choice for importers, but we've also seen Spanish variants, too. How many models of the Galaxy Tab 10.1 are there? All up there are six models of the Galaxy Tab that we've found for sale online — three Wi-Fi only models and three Wi-Fi + 3G models, both in 16GB, 32GB and 64GB variants. The 3G version of the Galaxy Tab 10.1 will work on all Australian networks as it’s a quad band 3G tablet. This means the Galaxy Tab 10.1 supports Telstra's 850MHz Next G network, along with the 900MHz and 2100MHz networks used by Optus and Vodafone. Keep in mind that the Galaxy Tab 10.1 does not have a microSD card slot, so there is no way to expand the memory. Take this into account before you decide to purchase the 16GB version of the tablet. We recommend the 32GB model if you're undecided. Where can I purchase the Galaxy Tab 10.1? Obviously, you won't be able to go down to a local retailer like Myer or JB Hi-Fi and purchase the Galaxy Tab 10.1: this is a direct violation of the temporary injunction that Apple successfully imposed against Samsung in the Federal Court today. 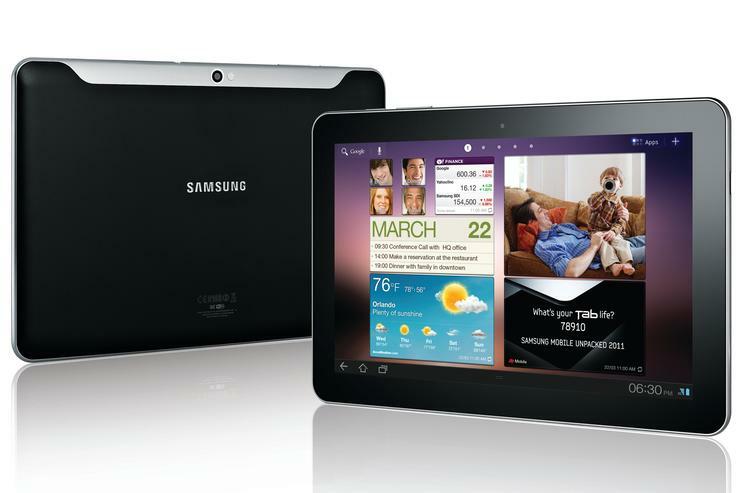 You can however purchase the Galaxy Tab 10.1 online from a variety of Web sites. eBay is your first option. A simple search for "Samsung Galaxy Tab 10.1" brings almost 2000 results at the time of writing. A lot of these are accessories like cases and cables but there are plenty of sellers offering various models of the Galaxy Tab. Unlike most other sites, you'll find almost all variations of the Galaxy Tab on eBay — there are black, grey and white models listed along with Wi-Fi only and Wi-Fi + 3G devices in all available storage options (64GB, 32GB and 16GB). The most common model seems to be the 32GB variant. The advantage of eBay is that it offers the widest choice that we've come across online, both for the device itself and the optional accessories. The disadvantage is that many of the Galaxy Tab 10.1's on eBay are ludicrously overpriced. As an example, a 64GB Wi-Fi + 3G variant of the Galaxy Tab is listed on eBay for as high as $1049. eBay can also be hit and miss: try and purchase from a reputable seller, called a "top-rated seller". Remember, if it sounds too good to be true, it usually is. The Samsung Galaxy Tab 10.1 can also be purchased through a variety of online stores. One of the most reputable is Australian site MobiCity. Unlike Australian online stores Kogan and Millenius, which were forced by Apple to stop selling the Galaxy Tab 10.1, MobiCity currently has the 32GB and 16GB Wi-Fi-only models of the Galaxy Tab 10.1 listed for sale. The main advantage to MobiCity is that the store offers a 12 month Australian warranty. This is not a Samsung warranty, but is serviced by a company called Australian Warranty Services. The basic warranty that comes with any MobiCity purchase includes replacement within the first 48 hours if the product is dead on arrival (DOA), an assessment guarantee within 48 hours of receipt and a repair guarantee within 30 days. MobiCity also says that a replacement device will be offered if it is unable to repair the tablet within the guaranteed timeframe. Expansys, Techrific and dMavo are other Australian sites that list the Galaxy Tab 10.1 for sale. Expansys offers a one year limited repair warranty and promises a full refund or replacement if the device is found to be faulty within 14 days, while Techrific will replace faulty and/or dead on arrival products within seven days. dMavo will replace faulty products within 30 days of purchase: the product will either be repaired or replaced with an identical item. Australian sites aside, there are also a number of international sites who will ship the Samsung Galaxy Tab 10.1 to Australia. Two of the most popular are the UK pair Handtek and Clove. Handtek currently sells all three variants of the Wi-Fi + 3G version, while Clove lists the 32GB Wi-Fi only model along with the 32GB and 64GB Wi-Fi + 3G models. International obviously means extra shipping charges to Australia: Clove charges £24 pounds (around $37 at the time of writing) while Handtek will ship a product for £28.90 (around $45). Be sure to factor this into your purchasing decision if you decide to buy from overseas. Other legitimate sites that will ship the Galaxy Tab 10.1 to Australia are Hi Mobile, SG Best, Simply Electronics and GimiDigi. Found a site that will ship the Samsung Galaxy Tab 10.1 to Australia? Let us know in the comments below!